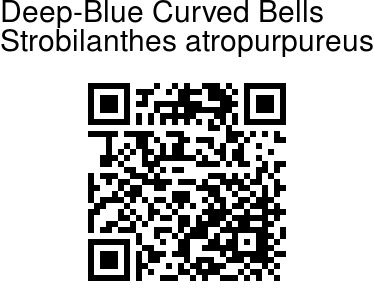 Deep-Blue Curved Bells is an erect, up to 3 ft tall, perennial shrublet with succulent, 4-angled or deeply 4-furrowed, white vlevet-hairy branches. Leaves are almost hairless, stalkless or with up to 8 cm long, winged stalk. Blade of lower leaves on sterile shoots is elliptic-oblong, 25-30 x 6-8 cm, long-pointed. Blade of flowering shoot leaves is ovate or ovate-lanceshaped, 3-7.5 x 2.5-3 cm, toothed to sharply toothed. Flowers are blue to dark blackish-blue, 2.5-3 cm across, single or paired, in interrupted leafy, up to 15 cm long spikes. Bracts are leaf-like, up to 2.5 cm persistent. Bracteoles are linear-oblong, hairy. Sepal tube is 5-lobed to the base, about 1.2 long. Sepals are linear-oblong, about 0.8-1 cm long, blunt, patently glandular-hairy, slightly enlarged in fruit. Flowers are 2.5-4.5 cm long, tube pale to nearly white, cylindrical below, curved above, hairy within. Limb lobes are nearly equal, blunt. Filaments are hairy. Style tips are recurved. Capsule is oblong, 1.6-1.8 cm long, 4-seeded, hairless. Seeds are 3 mm hairy. 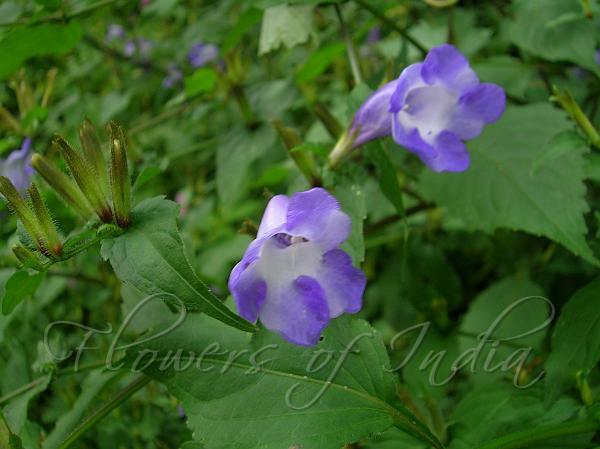 Deep-Blue Curved Bells is commonly found growing gregariously in the Himalayas, from Indus eastwards, at altitudes of 1300-3600 m. Flowering: June-October. Identification credit: John Wood Photographed in Valley of Flowers, Uttarakhand & Doodhpathri, Kashmir.